SHATTERED PARADISE is powerful, compelling, emotional, and, at the end, liberating. Be prepared to cry and gasp at some of the passages in this book. Araguti does a great job of bringing the Nicaragua of her memory to life with its legendary rainforest, colorful characters, vivid and graphic narrative and a love of a country that pours forth from her pen in splendor and darkness both. And, it is through the eyes of the child that we see the innocence, the beauty of what once was. And now, through her memoir “that” Nicaragua lives again. SUMMARY: Ileana’s life began in Nicaragua, “the land of lakes and volcanoes,” in a tiny Spanish colonial town known as the City of Mist. Life was beautiful, an idyllic paradise. Until the revolutionary war came and destroyed her town, her family, her life, her innocence. After the death of several of her siblings, her mother chooses Ileana to go with her to America. There the culture shock, the different language, the despair of leaving everyone and everything behind drives a wedge between mother and daughter. Ileana pours all her rage, pain, fear and anger into her diaries. For years, she writes about her lost brothers and sisters, the neighbors, the town, the mist. It takes Ileana 24-years before her return to Nicaragua as a married woman with children. She is devastated at the destruction of her homeland. It seems like there is nothing left of the Nicaragua of old. But, there is! The town may look different, but some of her siblings survived, some of the old families as well. Survivors all, with the same old roots to the community, to their nation. The reunions are hard and heartfelt. ABOUT THE AUTHOR: Ileana Araguti is a Nicaraguan-American. 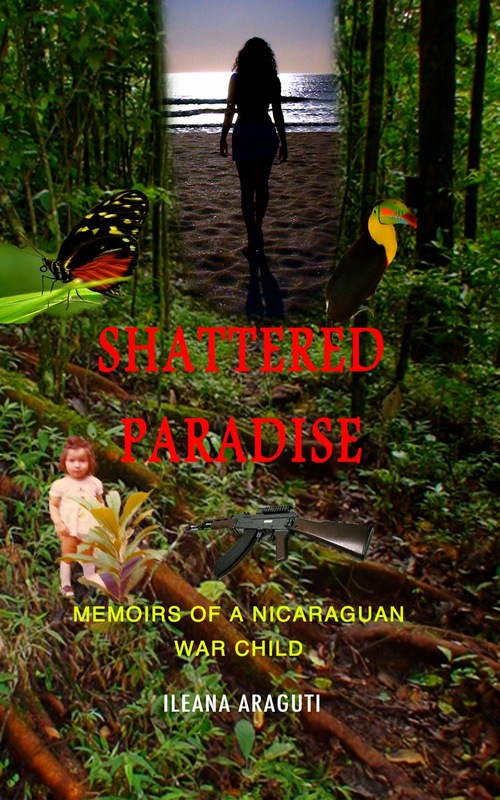 Her book, SHATTERED PARADISE: Memoirs of a Nicaraguan War Child, was a non-fiction inspirational finalist in the 2013 Readers’ Favorite International Book Award contest. To learn more about Ileana and her country visit her at www.ileanaaraguti.com and follow her blog at http://www.ileana4earth.blogspot.com/.